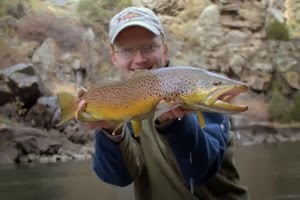 This past weekend, I was able to get away for a float trip with David Perry. We wanted to check on how the Caney was fairing. 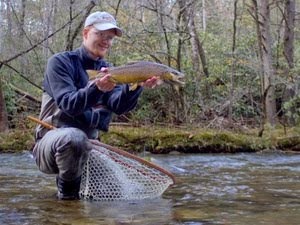 While some people were looking for spawning browns, we took a different approach and looked for big fish chasing streamers early while the water was high. Rainbows are really feeding heavily right now in preparation for the colder months ahead. 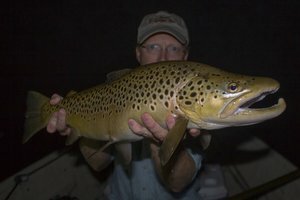 Early in the float, I had just switched to one of my favorite streamers, a Stacked Blond (super easy to tie as well), when a nice little brown of about 16 inches slammed the streamer about two strips into the retrieve. After a brief fight in which the fish was no match for my 7 weight rod and 12 lb. 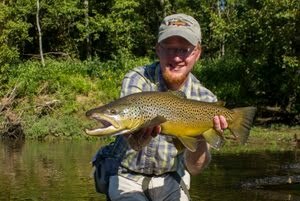 tippet, we quickly netted him, took a couple of pictures, and watched the first score of the day swim off into the now receding flows. Continuing down the river, we eventually started fishing the nymph rods, picking up the odd brookie or rainbow. However, the best fishing was still to come. As it got later in the day, the fish started to look to the surface for the increasingly heavy midge hatch that also had a few caddis thrown in. Lots of fish started to rise as the sun drifted lower in the sky. Finally, that moment all good fly fisherman are looking for arrived. A pod of big risers was located. The drift boat was maneuvered ever so carefully into position, and we began probing the water and switching patterns until the magic fly was discovered. I didn't have the pattern I wanted as I haven't been tying midge dries lately. Now is the time to change that problem because David Perry did have the right pattern and his reward was large! A big rainbow sipped the fly ever so gently. The next few moments were tense as the big fish ran straight for a big log, veering up and over it at the last second into open water. 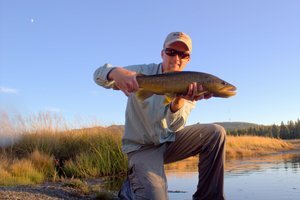 Finally the beautiful fish was in open water, and I backed the drifter over to the shallows for a couple of pictures. Wonder how a Thinmint would work on the Caney? If you can't find any, send me your address and I'll mail you a couple.